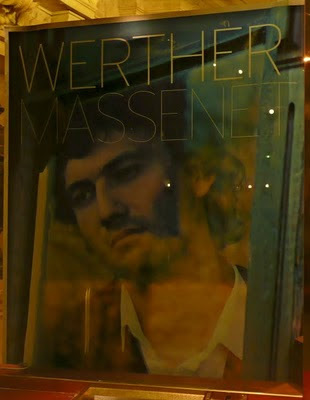 Massanet's Werther is based on Goethe's novel Die Leiden des Jungen Werthers, 1774, which was the birth of Romanticism. From that day Goethe was one of the most famous people in Europe. He didn't have a similar success until Faust many years later. Everyone in the nineteenth century composed a Faust, but only Massenet seems to have done Werther. By the time of the opera in 1892 Romanticism had run its course. People had been dying on the opera stage for many years. 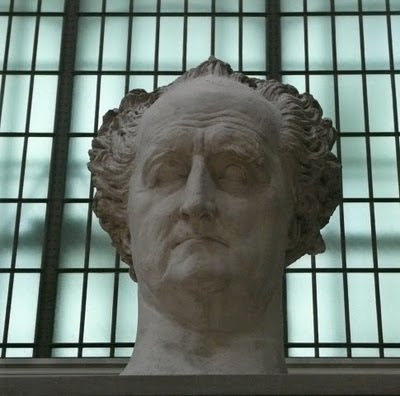 Bust of Goethe from the Musée d'Orsay. In the novel the hero's heart is broken and stays broken until he ends his life. Charlotte cannot be blamed. She promised her dead mother to marry Albert, and she must fulfill this promise. Sometimes trajedy cannot be avoided. At the beginning of the opera Werther is already in love with Charlotte, and they spend the day together. He tells her he loves her, and then her sister cries out that Albert has returned. Oh yes. Albert is her fiancé. Should have, could have mentioned. In the opera she is ambiguous, flirtatious. In the second act Charlotte marries Albert, and everyone tells Werther (Vair-tair) to cheer up or get out. He chooses to get out. It is only in the third act that Charlotte truly comes to life. She reassured her husband there were no regrets but finds that she cannot forget Werther. Who writes. He tells her he is alone and in despair. Then he appears and woos her again. The opera character is more manly than the whiner of Goethe's novel. She panics and leaves. He returns to his hovel and shoots himself. She finds him and there is an extended death scene. How is one to explain the extreme beauty of this performance at the Paris Opera? It is a question of atmosphere. Werther concerns itself primarily with the interior landscape of the hero's mind. It is all a gentle romantic dream that turns to despair and self destruction. All of the components combined to express this interior landscape. The production contributes with its cool, bare, minimalist sets. 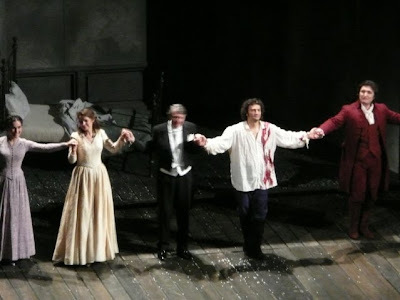 Anne-Catherine Gillet as Sophie, Sophie Koch as Charlotte, Michel Plasson conductor, Jonas Kaufmann as Werther, Ludovic Tézier as Albert. They are standing in front of the set for the last scene. And then there is the masterpiece of Michel Plasson's conducting and the almost impressionistic effect of the orchestral playing. The orchestra actually received the biggest ovation with sustained rhythmic clapping before the third act and again at the end. Perhaps it works to conceive it as Impressionism. It is an enormous pleasure to praise a musical concept. 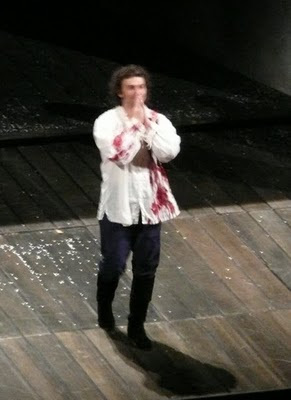 Jonas Kaufmann in this musical context is so much more than a mere singer--he is the spiritual incarnation of the interior landscape that is Werther. They none of them struggle against the hero's inevitable destruction but allow themselves to be swept away. It was a masterpiece beyond my wildest imaginings. Werther will never be the same. 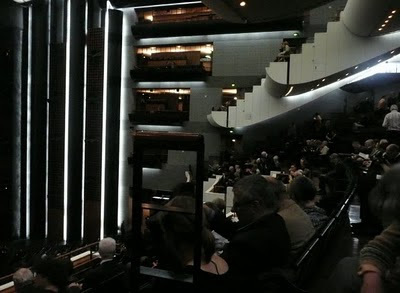 Interior of the Opera Bastille from my seat.